The venue entrance is on the other side of the main entrance (52 Oxford St), closest GPS address to our venue entrance should be 32 Oxford st, meter parking is on the side of 32 Oxford st. After you enter the building, turn right to the lower level. In case you find it difficult to locate the entrance like me, here is the picture of the building. If you prefer to park in the garage, we recommend our attendees to park at 52 Oxford St. Garage, the weekend permit is $8.00 per day. If you park in the garage, remember to print out the ticket. Please note that parking permit can only be purchased from two weeks to one day in advance, but NOT on the day of the event. The first-time user needs to register. To complete the registration (as “visitor”), use “Visitor to Campus” as your department and department code 7700. 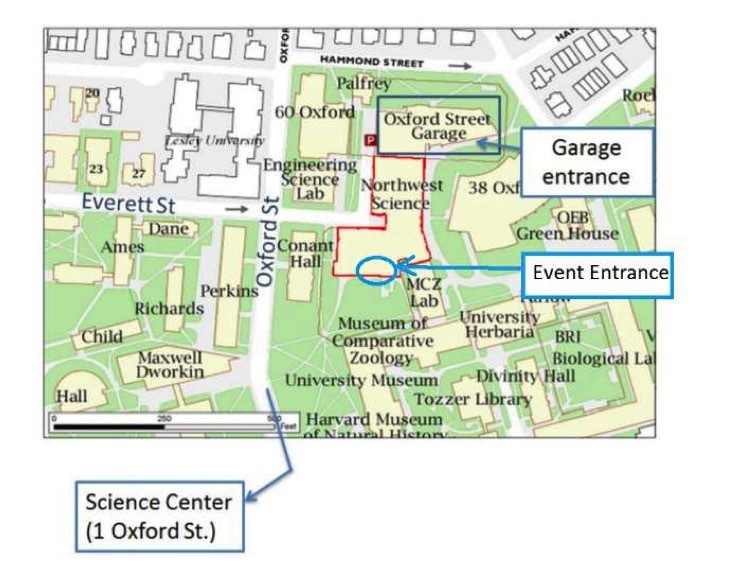 You will receive a confirmation e-mail from Harvard University Daily Visitor Parking Permits Online Purchase System. Click the provided link to confirm registration. You can now log in as a visitor with username and password you just created. the same as in 1. This information has to be provided every time after you log in. Choose the intended date(s) to park on campus. Provide your vehicle’s plate number and issued state. Hit “Add Parking Permit” button when completed. Agree with the disclaimer before proceed. After you hit “complete order,” you will be re-directed to PayPal.com to pay for the permit. Please note that if errors occur during re-directing, try to use a different browser (different browsers may work on different computers.) After logging into the system with a different browser, you should be able to find your unfinished order in “My basket” tab. Use either PayPal account or debit/credit card to finish purchase. the permit on your dashboard before you leave.